Though dramatic courtroom scenes make for great TV, the truth is that many criminal cases are resolved by plea bargain long before the trial. In short, the plea bargain process involves you agreeing to lesser charges or a reduced penalty, in exchange for a guilty or no contest plea. Still, there is much more to these agreements than negotiations and a handshake. Rule 3.171 of the Florida Rules of Criminal Procedure covers plea discussions and agreements, and the language lays out the responsibilities of the prosecuting attorney, defense counsel, and the judge who is presiding in your case. 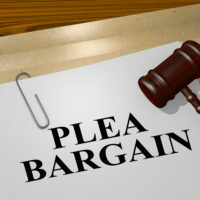 You should always work with an experienced Florida criminal defense attorney with plea bargains, as the agreement has a significant impact on your criminal record and sentencing. You may find it helpful to read an overview of the process and your rights under state law. Rule 3.171 authorizes plea agreements, placing final authority for the arrangement with the trial judge. The language even encourages the parties to discuss and agree on various sentencing options, depending on the severity of the crime and surrounding circumstances. If you do not have an attorney, all conversations must be recorded by the court. Beyond this general statement allowing plea bargains, the rule establishes requirements for the relevant parties in a criminal case. The prosecutor may engage in plea agreement discussions, and make a recommendation regarding the arrangement. He or she must inform the judge of all material facts in the case, and may get input from the victim, investigating officer, and other interested parties. Your defense attorney can advise you on all relevant details about accepting a plea bargain. However, your lawyer must get your full agreement and consent before the agreement can be accepted by the court. The judge has final authority on a plea bargain, so it is possible that he or she could ignore the plea bargain – even after the prosecution has agreed to it. It is rare for a trial judge to go against the recommendations of the prosecutor. If the judge does not concur with the proposed plea agreement, he or she must inform the parties of any factors behind the decision. Under Florida’s mandatory minimum sentencing structure, a judge cannot allow a plea bargain for a lower term of incarceration. However, the judge can issue a sentence for imprisonment under the statutory maximum. When the judge approves and the agreement becomes official, your plea will be entered into the record and your sentence begins. In the event that the judge does not consent, your guilty plea may be voided by the court. Your case will move forward to trial as if the plea bargain did not occur, but none of your statements during the discussions can be used as evidence. If you would like more information on plea bargaining and how it could affect your case, please contact Fort Lauderdale criminal defense attorney Kevin J. Kulik. We can schedule a consultation to review your circumstances, and tell you the pros and cons of entering into an agreement.